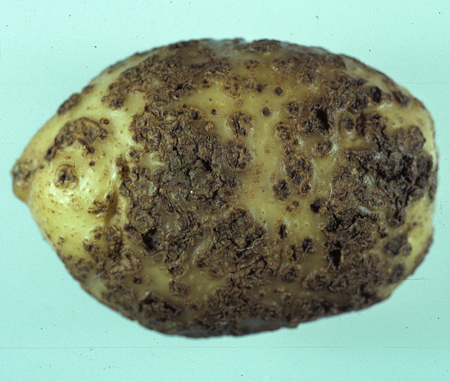 Common scab of potato is caused by three species of Streptomyces: S. scabies, S. acidiscabies, and S. turgidiscabies. These bacteria are present in most potato production areas and generally don’t affect yield, but significantly reduce tuber quality. Scab may also infect beet, radish, rutabaga, turnip, and parsnip but is seldom of economic importance in these crops. Symptoms are limited to tubers and in some cases stolons and consist of tan to dark brown, circular or irregular lesions which are rough in texture. Scab may be superficial (russet scab), slightly raised (erumpent scab), or sunken (pitted scab). The type of lesion is dependent on potato cultivar, tuber maturity at infection, organic matter content of soil, strain of the pathogen, and the environment. Pathogenic Streptomyces species are soilborne as well as seedborne. Some may be present in nonagricultural soils. Disease severity is greatest in warm, dry seasons and in light, sandy or gravelly soils. Start with scab-free seed tubers. Increase rotation with nonhost crops to 3-4 years. Maintain adequate soil moisture during and after tuber set. Plant resistant or tolerant cultivars. No potato variety is immune to scab. Avoid application of soil amendments that increase soil pH. Avoid application of animal manures from animals fed infected tubers or stems. Apply organic matter to increase soil’s water holding capacity. Seed treatments with captan or mancozeb provide some control.